Welcome to this month’s BioNews. We must learn to free ourselves from the control that others exert over us. As we learn we become FREE, we become powerful. This pursuit of self defense in wellness, I call “The Martial Art of Wellness”. 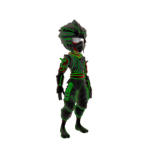 And as we practice we become Wellness Ninjas. For the purpose of this article, I describe “synthetic” supplement as those supplements concocted (chemically synthesized / extracted) by man, usually composed of one or more molecules (chemical) vitamins, minerals, enzymes, antioxidants, phytonutrients, amino acids, etc. These supplements never occur in such proportion or simple organization in any food. Typically they are single isolates or blends of isolates derived from chemical processes, or if from food, they are separated or extracted via chemical processes, their molecules are never identical to those occurring in food, and never occur with their natural co-dependent brothers and sisters molecules, as it always does in foods. Most vitamin supplements found in drug and health food stores do not contain natural vitamins, but in fact, are synthesized predominantly from petrochemicals and less frequently from plants. There are three basic types of supplements: synthetic, crystalline, whole food. These are available in numerous variations and combinations. Synthetic vitamins are those that have been developed in a laboratory. They are isolated chemical versions of vitamins. Crystalline vitamins originally had a natural food source, but have been extracted and isolated by processes that may have involved substances such as chemicals and solvents and high levels of heat. Many supplements that are called “natural” have a food base but the primary ingredients are USP or synthetic vitamins because to claim the right to be natural, a supplement needs only to originate from a natural source and/or be as little as 10% natural. Even supplements derived from natural sources such as herbs, yeast, foods such as rice bran, berries, etc, can be useless due to heat, pressure, or other processing techniques that destroy their enzymes. Chemically, natural and synthetic vitamins may appear identical, but there has been found to be important distinction, beside their size, often much larger. When a beam of polarized light passes through a natural vitamin it will always bend to the right, due to the molecular rotation of the natural substance. The letter “d” seen on some supplement labels represents dextro or “right”. This indicates the vitamin is the natural form. As a beam of polarized light passes through a synthetic vitamin it splits into two parts: one part bending to the right and the other to the left. Therefore, there is the letter “d” for right and “l” for left. Synthetic supplements, therefore, may be represented by the letters “di” preceding the vitamin name. This polarized light test shows that the biological activity of synthetic vitamins can be 50%-70% less than nutrients in natural, whole food supplements. There may be times when a synthetic supplement may be useful and effective, but we feel that, for the long term, a truly natural supplement would be best. 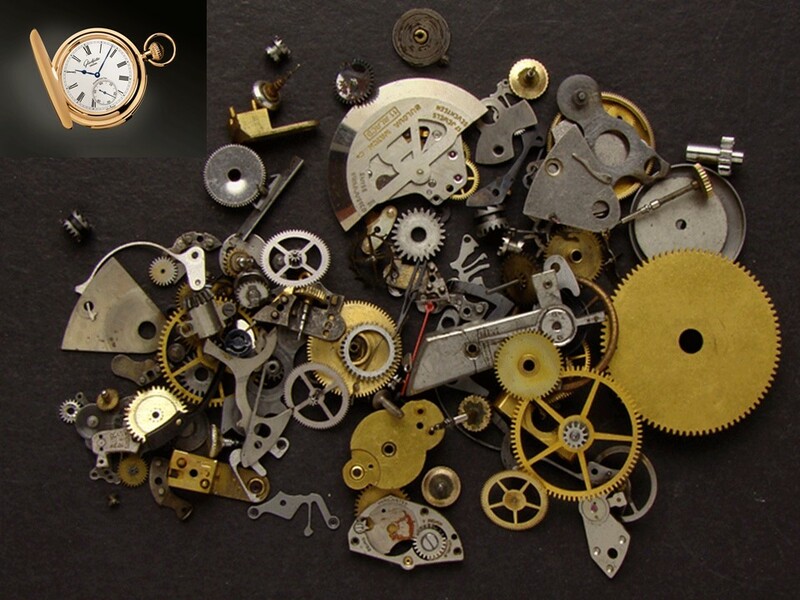 It is well known that synthetic vitamins fail time and time again when put to scientific tests. Hundreds of studies have proven the superior efficacy of whole foods and whole food supplements as compared to synthetics. Do you believe that supplements can replace whole foods? It is estimated that the bio-availability of synthetics is between ZERO and 40%. Much research shows that some of these supplements are toxic. How many supplements are you taking? 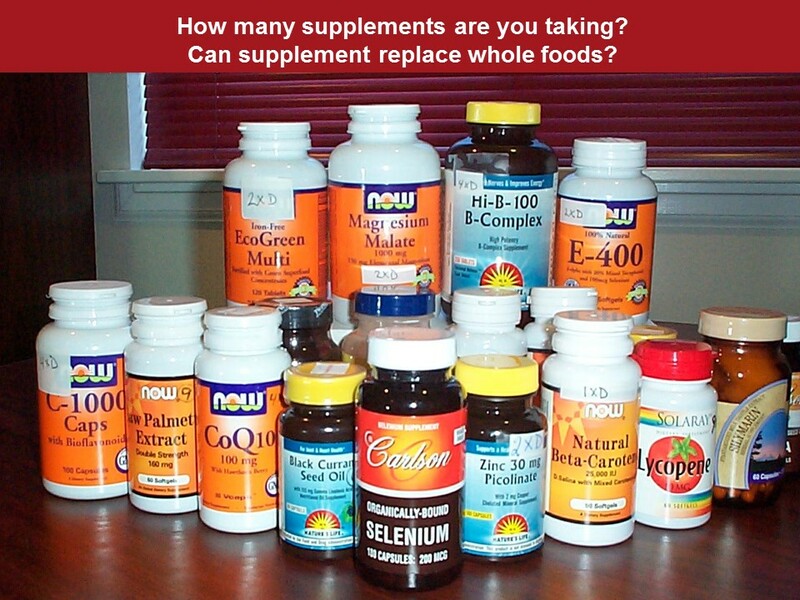 Do you believe that supplements can replace whole foods? 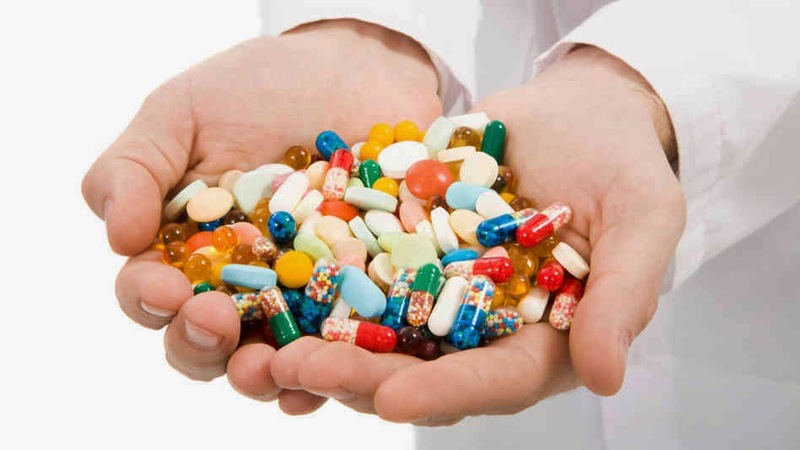 It is estimated that the bio-availability of synthetic supplements is generally between ZERO, and well below 80%, and much research shows how often these supplements can be toxic and dangerous to your health. Most often supplements are available in mega doses – quantities/amounts that are much greater than what our body needs, or can tolerate. An example of a synthetic supplement (and supplementation) is vitamin D that is nowadays often taken in doses of 50,000IU/Day. 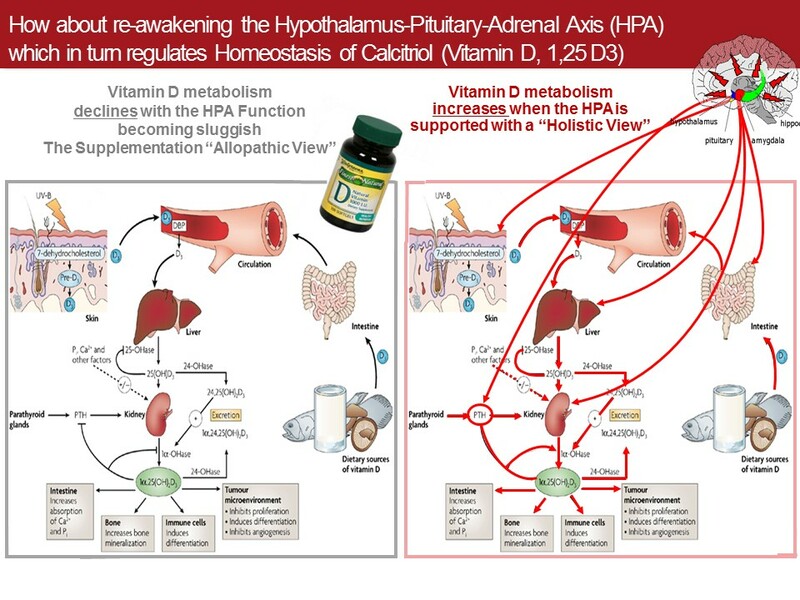 Vitamin D is perfect to represent synthetic, as firstly vitamin D is not truly a true vitamin; it is a hormone resulting from series of metabolic actions first triggered by enzymatic reactions to energy (light) continuing in cascading chemical transformations and supercharged by specialized cells at the kidneys when stimulated via the Para-Thyroid Hormone (PTH). On the left shows that when you accept to take a synthetic vitamin D to fill your deficiency, you have accepted “hormone replacement therapy”, to wear crutches for life… You are agreeing with the popular belief and giving up on your innate ability to restore the whole orchestration of the vitamin D metabolism as shown on the right. It is estimated that the general bio-availability of synthetic supplements is between ZERO and below 50%, and much research shows how often these types of supplement can be toxic, even dangerous to health. For decades now, common sense and research has shed doubt on the lack of biological activity of synthetic supplements. What about the life force? The difference between synthetic supplements and nutrients occurring in food is apparent when viewing their response to a beam of polarized light. The light when passing through a natural vitamin will always bend to the right due to its molecular rotation. 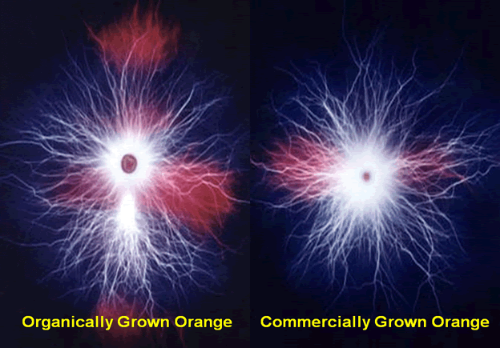 Photography of natural nutrients taken with a Kirlian camera always shine brighter then synthetic ones. The life force of natural nutrients cannot be replicated with synthetics. Synthetic supplements may look like the real thing but they won’t function like the real thing. Synthetic supplements are like the image in a mirror. Half of it may work in the body and the other half may not work as well. Proponents of synthetic supplements might claim natural and synthetic are equally effective but they are wrong. I’ve alluded to this throughout this series, and it deserves repeating: there’s no such thing as an isolated vitamin or mineral or any other separated nutrient growing in nature. For example, there are no “Vitamin C” fruits growing on trees; all fruits offer a spectrum of vitamins and minerals. There are no “Calcium leaves” on vegetables; all vegetables have an assortment of minerals and phytochemicals that work synergistically to support human health. 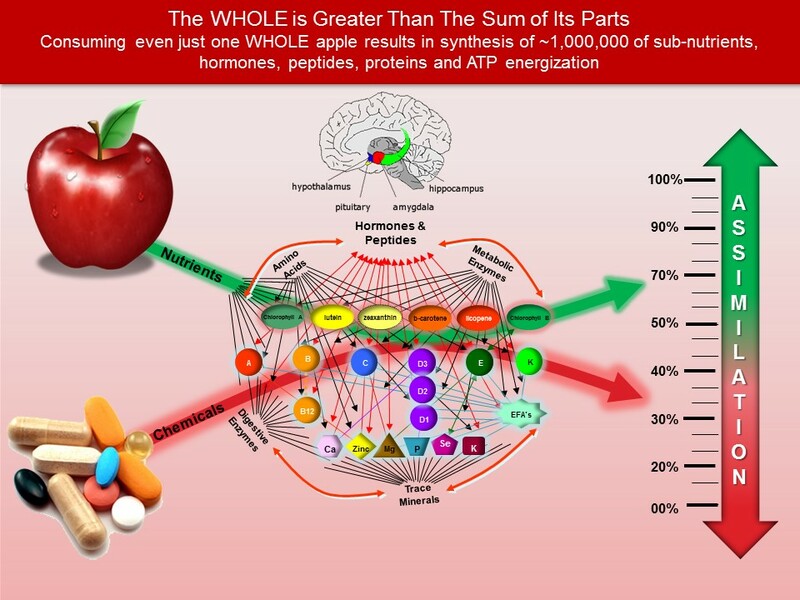 Whole food sources provide a wide spectrum of abundant and synergistic elements that work together in the human body in ways that no scientist can truly comprehend nor replicate. 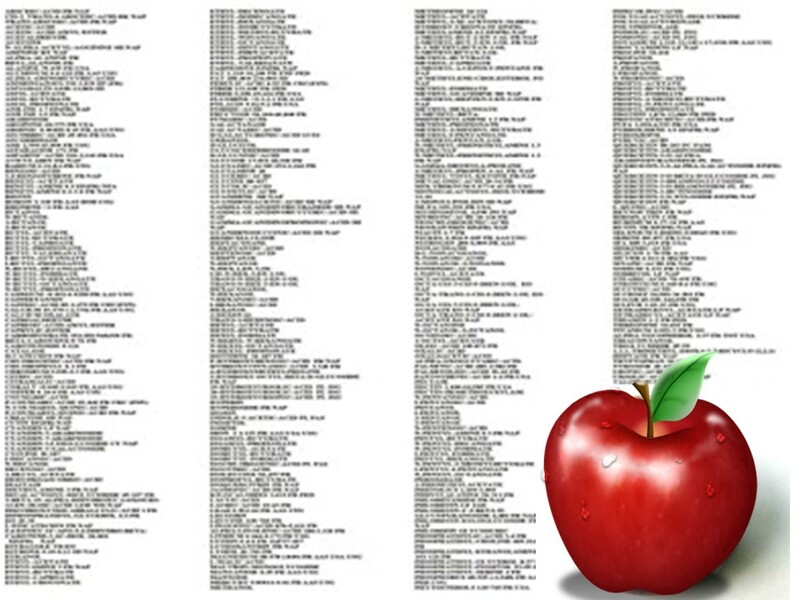 Contemporary scientists have not yet identified the tip of the iceberg in the domain of phytochemicals, those microscopic elements found in fruits, vegetables and micro-algae, much less studied their combined effects in any detail. All of us have been hearing about vitamins since we were small children. Still today we hear authoritative sources say, “Be sure to take your vitamins!” But, today we have also proven that all the vitamins in the world do us little good without minerals! Why do people continue taking them without minerals? Vitamins are a group of chemically unrelated organic nutrients; carbon, oxygen and hydrogen which are essential in small quantities for our normal metabolism, growth and well being. Vitamins must be obtained through diet since they are either not synthesized in our bodies or are synthesized in inadequate amounts. Minerals are very different from vitamins in their structure and the work they do. According to Rodale’s Complete Book of Minerals for Health, minerals create a healthy environment in which the body, using vitamins, proteins, carbohydrates and fats, can grow, function and heal itself. But for this working relationship to happen, both vitamins and minerals must be eaten together. Only then can we benefit from the harmonious synergistic power of vitamins and minerals. Recently, we often hear about the importance of enzymes and anti-oxidants. Enzymes are extremely important for our multitude of metabolic functions, but enzymes like vitamins, also do us little good without minerals, and conversely, some vitamins are helpmates to minerals. Some minerals are eager workers, but to perform at all they need a vitamin or two to stir them into action. For examples, vitamin C can significantly increase iron absorption, and calcium absorption is impossible without vitamin D.
Basically, the size scale reveals that “inorganic” clay, silt and hydrophobic metallic minerals, on average, are considerably larger than “organic” hydrophilic acids or hydrophilic plant minerals. The research clearly indicates that bacteria, viruses, clay, and humic metalo-complexes (metallic or synthetic minerals) are considerably larger than hydrophilic (plant) complexes such as hydrophilic plant derived minerals. Pure plant minerals can be pumped through a pharmaceutical grade: .05-micron absolute filter. Most metallic minerals will not pass through this small membrane. Only water passes through. Note: A water molecule is only slightly smaller than hydrophilic complexes. This small size and water solubility is one of the reasons plant minerals are much easier to assimilate or absorb than metallic minerals. When comparing the size and weight of metallic and plant minerals, it is easy to verify that the molecular weight of hydrophilic (plant) complexes is considerably less than metallic complexes. In short, this clearly indicates there is a great difference in, generally known, “metallic minerals” and “plant minerals”. Nowadays, with most vitamin supplements, even when some marketers claim”of natural source”, it is well understood that you will not obtain efficient bio-availability. For examples; the whole vitamin C complex (not just ascorbic acid) needs minimally a certain amount of zinc, calcium and magnesium to be absorbed. Vitamin E requires at least some selenium to be absorbed. To be absorbed, vitamins A, D, E and K require the fatty acids omega 6, 3 and 9 in proper balance. And so forth at the level of cellular nutrition, for proper balance and synergy, there are endless molecular requirements that can only be obtained with whole food base nutrition. This diagram is an futile attempt at representing the complexity of the factors, co-dependencies and relationships occurring during digestion, factors which will yield to EFFICIENT or POOR assimilation, absorption and utilization of the nutrients within the ingested food. It is estimated that the bio-availability of synthetic supplements is generally between ZERO, and well below 80%, and much research shows how often these supplements can be toxic and dangerous to your health. I often ask people if they think they could live off a bunch of vitamin and mineral supplements. Interestingly some people don’t know the answer. Obviously we cannot replace food with supplements. It is a matter of digestion, assimilation and energy; and there is no nutritional substitute for “real” food. Real food not only has more nutritional value than supplements, but also, real food offers the nutrition in a way that our bodies can absorb the nutritional value and derive ATP energy (life) that no supplement can. All our nutritional requirements can be met with a varied diet of many organic whole plant foods, fruits. And health wise, there is a world of difference between synthetic and natural when you take into account energy units return per consumption, natural will always be more effective and cheaper in the short and the long run. Knowing what you now know, which would you choose; the food in the mirror … or the real thing?